Image: An engraving of Samuel Wyatt’s classical façade for the Theatre Royal, New Street, Birmingham, from William Hutton’s History of Birmingham. 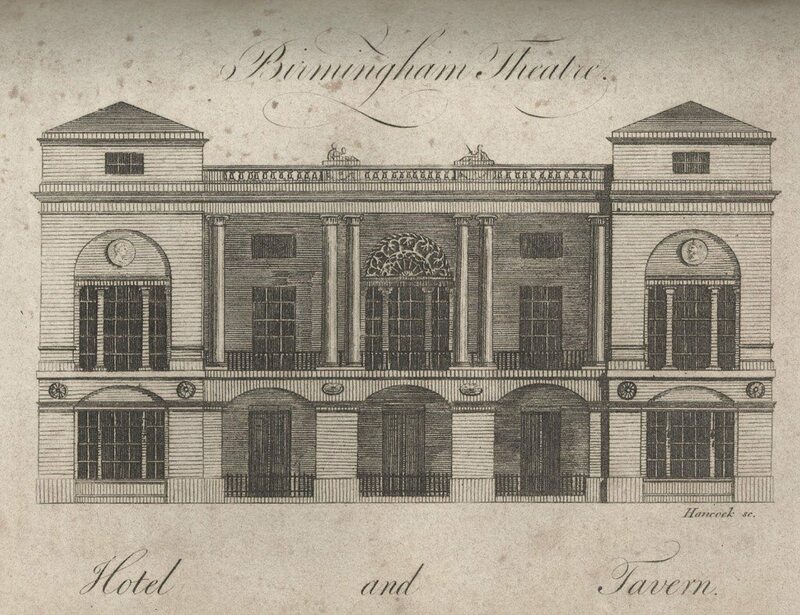 Hutton claimed that Wyatt’s additions in 1780 created “a superb portico…which may cause it to be pronounced “One of the first theatres in Europe” (An History of Birmingham…Fourth Edition, 1781, p 127). Architects of the Georgian era, striving to express new aesthetical and philosophical ideas, turned to the noble, restrained forms of ancient Greek and Roman architecture. Neo-classical buildings with their harmonious proportions, elegant pillars, and symmetrical wings reflected the Age of Enlightenment in British and European culture. In the Midlands, two of the best representatives of the new style were the brothers Samuel (1737-1807) and James Wyatt (1746-1813). They were the sons of Benjamin Wyatt, a Staffordshire builder and architect, the head of a family firm Benjamin Wyatt & Sons. In 1765, Benjamin Wyatt and Sons designed the factory and house at Soho for Matthew Boulton. Completed in 1766, the new factory with its simple, clear and elegant forms was a European wonder. At the age of 22, Samuel Wyatt was appointed as the clerk of works at Kedleston Hall, Derbyshire carried on by the famous Robert Adam. This gave him an opportunity to become acquainted with the greatest neo-classical artist of the time, and to gain practical experience in the design and construction of various buildings, in landscaping and draftmanship. Later Samuel Wyatt was to become one of the finest masters of interior decoration in the Adam manner. His brother James Wyatt went to Italy to study examples of original classical architecture. In 1774, after the death of their father, Samuel Wyatt settled in London, and for nearly thirty years he conducted a successful business as architect and builder. Both brothers worked widely throughout England and Wales. Among their buildings were city mansions and country houses, public and industrial buildings, churches and lighthouses. Samuel Wyatt mostly designed fine and restrained Neo-classical buildings, while James expressed himself in both Neo-classical and Gothic styles. Samuel Wyatt was among the first English architects to use the newly invented cement, or copper sheets and Welsh slates for roofing. He invented the catch for sash-windows, and the lantern for lighting staircase wells. This taste for modern techniques, experiment and innovation united him with the greatest entrepreneurs of the period. In 1783-86, Samuel Wyatt built the celebrated Albion Mill at Blackfriars, London, the first corn mill to be powered by steam. It accommodated two Boulton and Watt double-acting rotative engines, and was regarded as an architectural and mechanical wonder of the day. Matthew Boulton, who cultivated the neo-classical style, used his local influence to promote architectural commissions for the Wyatts. Samuel Wyatt remodelled Matthew Boulton’s warehouse in Livery Street, Birmingham. Chaste in design, and beauteous to the sight. In the late 1780s, Samuel Wyatt built the simple and elegant Heathfield House in Handsworth for James Watt. Both James and Samuel Wyatt took part in enlargements of the Soho Works. Improvements to Soho House were carried out by Samuel Wyatt after James had failed to give satisfaction. By the end of the 18th century, Birmingham and especially Handsworth, contained fine examples of Georgian architecture, partly because of the Wyatts’ buildings. Unfortunately, many of their works were cruelly demolished in the 20th century. But the true taste of the Wyatts’ neo-classical architecture can still be felt at Soho House, with its delicate and comfortable interiors; at the dignified Shire Hall, in Stafford; or at the magnificent Shugborough Hall, Staffordshire, which is one of the finest examples of Samuel Wyatt’s works in the Midlands. Avery, Derek, Georgian and Regency Architecture (2003). Colvin, Howard, A Biographical Dictionary of English Architects 1660-1840 (Yale University Press, 1995). Curl, J.S. Georgian Architecture (2002). Robinson, J.M. The Wyatts: An Architectural Dynasty (Oxford, 1979). Spencer-Churchill, Henrietta. Classical Georgian Style (1997). Documents regarding Wyatt’s architectural work on Albion Mill, Soho Manufactory, and Soho House are held in the collection of Matthew Boulton’s Papers at Birmingham Central Library.